The 300 Series Are The Most Popular And Versatile Large Cylinder Trucks Harper Produces. * The Continuous Handle Gives The Truck Frame More Rigidity. *Excellent For Construction Jobs Or Large Shops. *High Floor Clearance When Moving Over Rough Surfaces Or Cluttered Areas. *Angle Legs Remove Load From The Wheels When Truck Is Stationary. 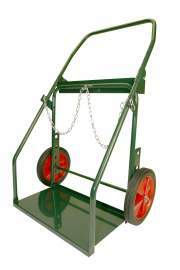 *Comes Equipped With A Bolt On Tool Box Which Makes Replacement Simple And Economical. *Holds Medium And Large Cylidners. *Comes With Cylinder Hold Chain Or Optional Belly Band. *Designate 'B' In Part Number To Indicate Belly Band. See Model Number 316B-72. *A Fire Barrier Is A New Option For This Series Designated By 'F' In Part Number. See Model Number 324F-32. *A Large Bolt On Lock Top Tool Box Is Also Available By Designating 'Lt' In Part Number. See Model Number 316Ltb-72.